We're considered to be one of the best garage door service providers in town, but did you know that we also specialize in repairing gate related issues? Our highly skilled technicians have been operating in this field for a very long time, and can help you with all sorts of different problems. Let's say you come home one night to find your gate system refusing to budge. No matter how many times you try to activate it, it simply won't open. The issue may be due to a circuitry problem inside your opener unit, or could reflect a remote control fault. Either way, our technicians can come to your rescue and take care of it. We'll examine your opener's circuit board for any burnt wires and test your remote to ensure the problem isn't there. We'll replace either, if it proves necessary. Your gate will be much more 'obedient' once we're through! 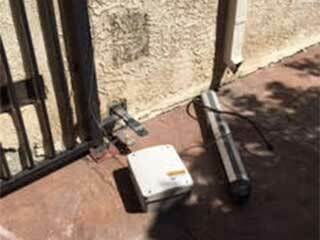 If the electrical parts of your gate are functioning properly, the problem may rest with the mechanical parts. We can take care of those too. If a motor gear has worn-out, your opener will stop working and you'll be unable to operate your gate. We'll quickly replace the worn-out component with a new one that'll function just as well if not better. If a broken hinge is the issue – not to worry, we can repair or replace those too. From a sliding gate to a swing system, to wooden, wrought iron, and even cantilever variations, our technicians can handle systems of every make and model. In addition, our maintenance routines - where we perform a thorough examination of your gate system, lubricate the necessary joints and replace any component that's found lacking - will ensure that your system stays optimized for longer. No matter what type of gate related problem you're experiencing, our experts at Garage Door Repair Highland Park can help. Contact us for professional assistance and quality service!